We keep getting dumped on by snow here in Copenhagen. Another 10 cm fell today. Me? I love it. 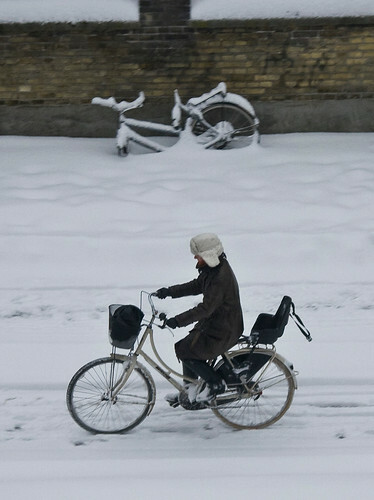 Actually, in Copenhagen 80% of the cycling citizens continue to ride throughout the winter. That's about 400,000 people. In the snow and adverse weather the number falls as people take to the buses and trains, but you're still looking at a couple hundred thousand people on bikes each day. The bicycle lanes have the highest priority and get cleared of snow and salted before the roads. Allowing the ever-chic citizens to roll along gorgeously. 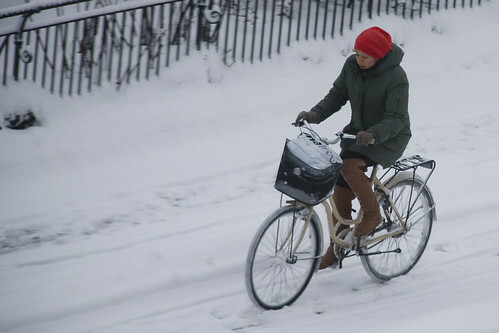 If you want to see how the City tackles the snow, click on over to Copenhagenize and try this tag on for size. that bike in the wall is there for a long time. I realize just right now, even when I live in mexico.